My reflection deals with the workings of the Spirit, but I would like to do so first by examining the phrase, “the pride of false humility.” What is pride? Pride can be understood as the feeling of, and consequent expression of being proud. In one sense, if one is proud, it suggests that one feels satisfied and happy that one has achieved something. What then is humility? Humility can be described as the feeling, and consequent expression of being humble. If one is humble, it could mean that one does not see oneself as better than others. So then, what is false humility? I suggest that false humility can be understood as the feeling, and consequent expression of being humble that is untruthful. In short, false humility is the pretense of being humble. It is also pride, because it is a refusal to accept the truth. In writing as one who has been, and continues to be guilty of this pride of false humility, my reflection is meant for myself as much as it is crafted for the reader. I am gradually realizing that although the Spirit of God resides in our hearts, we often do not open our lives to this Spirit. At times, our hesitance stems from an inordinate feeling of unworthiness. The idea that one is “not good enough” is the pride of false humility, because it is a refusal to accept the truth that the Spirit has been unconditionally and unreservedly poured into our lives. It is a turning away from this Spirit who desires to collaborate with us in opening the floodgates to gifts and talents that still lie dormant. Those of us who identify as gay, lesbian, trans*, bisexual or queer (LGBTQ) persons of faith have often been told that we are aberrations. We are told that we are “faulty products” or “damaged goods.” Unfortunately, many of us absorb these negative opinions of ourselves, and gradually interiorize a belief that we are useless, spoiled and abnormal. The feeling of worthlessness can sometimes be so overwhelming that it can lead us to cordon off the Spirit, thus effectively achieving “a muzzling of the divine, a preclusion of an openness” to the Spirit’s invitations. A false dynamic of unworthiness in the eyes of God sets in, and we live under the delusion that our self-imposed self-effacement is a sure mark of humility. Therein lies the pride of false humility. Conversely, true humility is to acknowledge that we are called to accept and celebrate ourselves as LGBTQ. True humility is to reject destructive rhetoric in all forms, and to turn instead to the belief that we are created by God to become who we are meant to become. 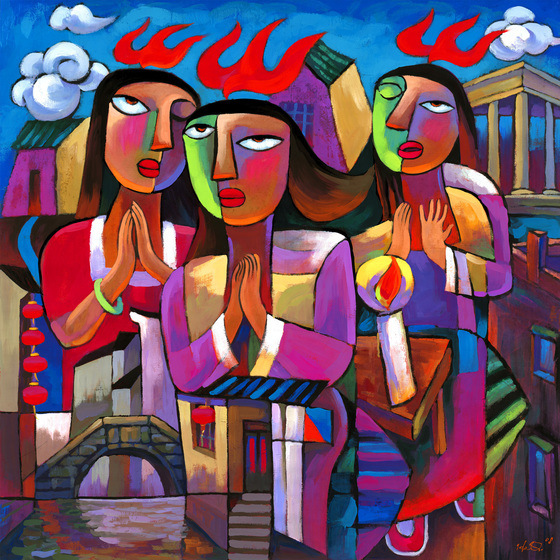 True humility is to come out of pride and into an admission that we are gifted in more ways than we can possibly imagine, and to cooperate with the Spirit in generously using these gifts for our workplaces, our homes and our communities. I propose that an effective collaboration with the Spirit necessitates an attitude of honesty. As LGBTQ persons of faith, we are called to be honest by going beyond a mere acceptance of the truth that we are created by God to become whom we are meant to become. To be honest in God’s eyes is to be vulnerable to possibilities of transformation. It is to face the reality that there are many areas in our lives, our relationships, our work and our communities that need re-evaluation, strengthening and/or change. Without honesty, we can never move forward and become the persons and communities that God wants us to become. I further propose that an effective collaboration with the Spirit requires a willingness to discern together as a community. Discernment bespeaks a belief that the Spirit has gifted each of us with insight. Discernment also demands that we listen actively and honestly to each other, and that we speak honestly from our hearts. I believe it is important to pause and remember that no one person has the fullness of knowledge, even if some of us may be better trained or more eloquent than others. To allow the Spirit to collaborate with us in our discernment does not mean that we are immune to disagreements or arguments. Yet the challenge, as I see it, is to ask ourselves if we are willing to allow the Spirit of God to work through our disagreements and arguments, not for self-glorification but for our personal betterment and the good of our communities. To collaborate with the Spirit requires a humility to move from an exclusively “it’s about me” mode to a more encompassing “it’s about us” approach. It is only when interiorized an attitude of honesty and a willingness to discern together that the Spirit of God can help us shed the pride of false humility, and propel us to thrive. I wish to express my gratitude to Rev. Miak Siew of Free Community Church, Singapore, whose ideas and thoughts inspired certain sections of this reflection. Joseph N. Goh, “Repent or Believe in the Closet: When Pastoral Care Is Anything But,” Queer Eye for God’s World, November 16, 2013, accessed June 16, 2014, http://wp.me/p2eHQm-85.